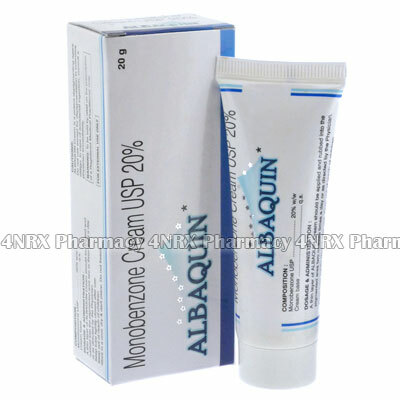 What is Albaquin Cream (Monobenzone USP) used for? Albaquin Cream (Monobenzone USP) is a topical medication used to create a more even skin tone in patients with vitiligo. The cream lightens the colour of skin next to the discoloured area to create a more even appearance. It should be noted that this medication is not cosmetic bleach and should never be used to remove blemishes or lighten skin in patients without vitiligo. Your doctor may prescribe it to treat other unlisted conditions, as well. How should I use Albaquin Cream (Monobenzone USP)? Strictly follow your doctor`s directions while using Albaquin Cream (Monobenzone USP) to get the safest and most effective results from treatment. It is normally administered two to three times each day, but your individual instructions will depend on the severity of your symptoms and your current health condition. It is recommended to rinse the skin before application to remove any loose skin or dirt. Always wear protective gloves when applying the cream to stop it from discolouring your palms. Put a thin layer of medication onto the normally pigmented area next to the discoloured skin, gently massage it in, and allow any excess cream to evaporate. Thoroughly wash your hands with soap and water to prevent the medicine from contacting any areas not being treated or the mucous membranes. Always ask your doctor any questions you have before using the cream to ensure the correct administration. What are the side effects of Albaquin Cream (Monobenzone USP)? Stop using the cream and contact your doctor as soon as possible if you experience any other worrying symptoms such as severe irritation, painful burning, intense itching, swelling, or a severe skin reaction. These conditions may require reduced application frequency or emergency medical assistance in serious cases to prevent further complications from occurring. Albaquin Cream (Monobenzone USP) is not cosmetic bleach and should never be used by patients who do not have vitiligo. Do not begin using the cream if you are pregnant, breastfeeding, or if the application site has broken or severely damaged skin. Strictly use Albaquin Cream (Monobenzone USP) as prescribed and follow all instructions provided by your doctor. Safe, suitable, and optimum dosage can vary and is dependent on the patient`s health and medical history, as well as the condition you are treating. Albaquin Cream (Monobenzone USP) may not be safe or suitable for all patients. Always ensure your doctor is informed if you are pregnant or breastfeeding, using any other type of medication (including non-prescription medicine, vitamins, and supplements), as well as if you have any allergies, other illnesses, or pre-existing medication conditions.